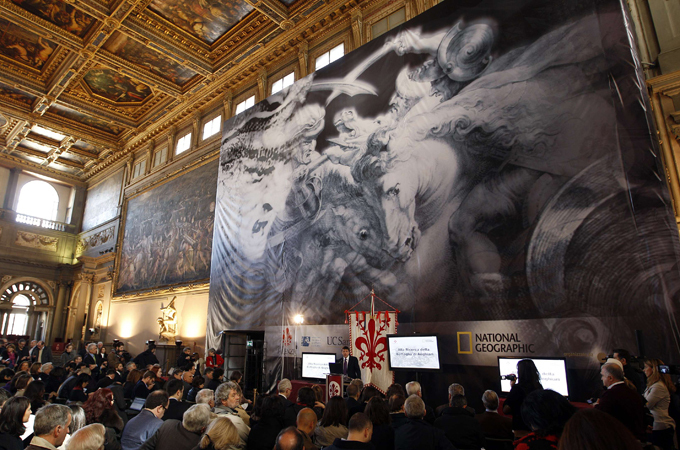 On March 12 2012 a press conference held at the Palazzo Vecchio in Florence presented the latest findings in the search for the Leonardo fresco Battle of the Standard, believed to be a section of an overall planned depiction of the Battle of Anghiari. Modern reports of this case have hence truncated the title to refer to the piece by the latter name. Having already covered the background to the search, this update will summarise the reaction of key figures to the new data, in the hope of separating it from the more sensationalist reports that have been making the rounds focusing on "Lost Da Vinci evidence found". It is also noted that a documentary summarising the findings of the recent investigation will be presented on National Geographic on March 18 2012 in the US. The recent phase of investigation was commenced on November 28 2011. 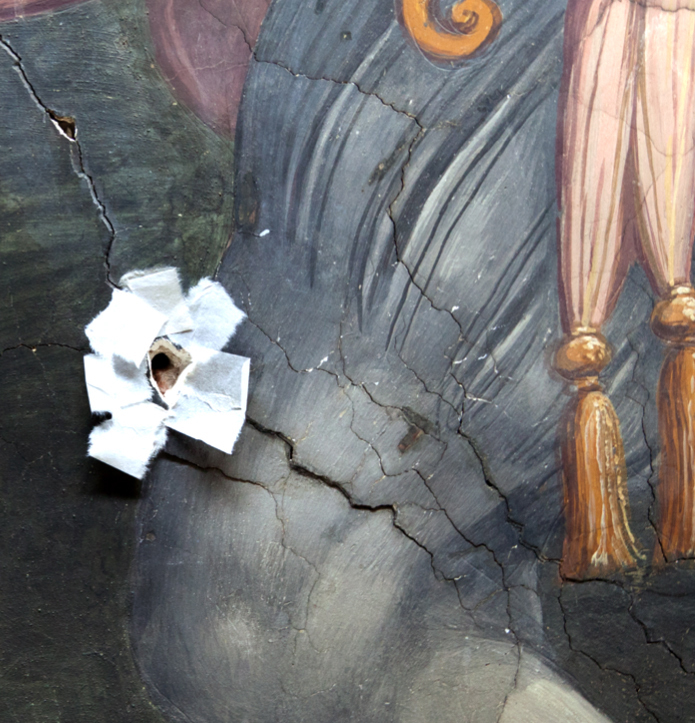 It was reported that Professor Maurizio Seracini's team drilled six 4mm holes into areas of the Vasari fresco where the plaster was damaged. A seventh hole was planned, in an apparently more intact part of the fresco, which attracted the ire of local and international commentators, describing the process as invasive. A subsequent Save Vasari campaign was mounted, and the Italian police called to the scene to prevent Seracini's intervention. ...the drama of this country is being played out in an exemplary form in this case, in that the management of cultural properties seems inevitably to be reduced to continuous showmanship, focusing on single works of art or single acts of restoration. This is an established custom that I consider highly negative, because it focuses attention only on undertakings that are related to matters of image, considering ten or twenty monuments with wide appeal while leaving the rest to deteriorate. ...The objection could always be raised that the investigation was launched with the stimulus of a private sponsor, which assumed all of the burdens and even gave the City Government funds that proved useful for its disastrous budget. "Precisely because one had the luck to find a sponsor of this kind, in times like these, it needs to be explained to me why this was not utilized for the real priority of priorities, that is to say the safeguarding and conservation of the historical and artistic patrimony, which everyone knows is going to ruin. This, let’s be frank, does not matter to anyone in the least because all that counts is occasional showy things, rather than investing day-by-day in the broadbased conservation of cultural properties that are spread widely through the Italian national territory. What makes me marvel, however, is that a region like Tuscany and a city like Florence does not set an example but quite the opposite. In the investigation that is currently under way in the Salone dei Cinquecento, it is well to repeat, the work is being done on the correct wall. My involvement is always on behalf of safe-guarding and managing the cultural property in question and keeping the officials of the Ministry of Cultural Properties and Activities informed...the involvement of the Opificio delle Pietre Dure, which normally intervenes only in a fully planned and shared program of research or restoration which has been put forward by me and planned by me, has increased the level of oversight, assuring that the operations are carried out with rigorous and competent oversight....the invasiveness of the project has certainly been much more limited than other types of diagnostic investigations that are truly ‘destructive’. 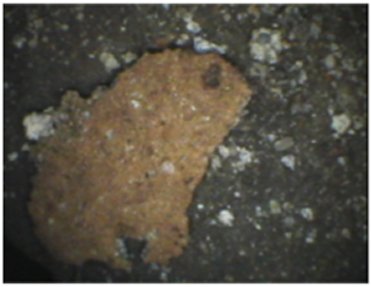 In some cases, these involve the removal of microsamples of the original paint surface. These are procedures which, none the less, are commonly employed in Italy and abroad in the analysis of painting on canvas, on panel and on walls, without giving rise to notable reactions. From an analysis conducted on the scaffolding, the Vasari’s fresco revealed damaged areas that had been partly restored in the past. 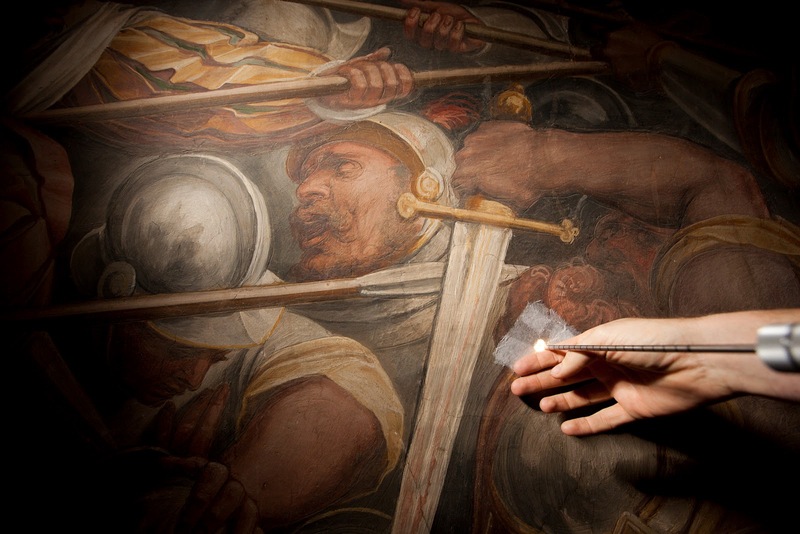 As a result of the investigations, explorations beyond the Vasari wall were conducted exclusively in those areas where the original color was already loose or was already eroded due to older damages. Alternatively, the research was conducted by utilizing existing lesions and cracks in the Vasari plaster. 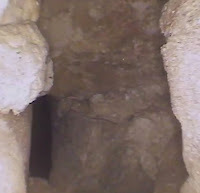 In two cases, in the area next to two cracks it was noted that small portions of plaster were already damaged and were at risk of detaching completely. Therefore, they were removed and relocated following standard restoration procedures. After that, it was possible to take advantage of the areas to further investigate underneath. Initially, seven points of entry were authorized to conduct the investigations with a 4-5 millimeter in diameter probe. Ultimately, the points of entry were only 6 and were accessed using the aforementioned techniques avoiding any damage whatsoever to Giorgio Vasari’s painting in particular removal of pieces of painted surface. At this point in the investigation, the University of California San Diego team continued with a series of chemical analyses and the study of materials following their request to take advantage of the six passages. The international press has been quick to spread news of the possibility of the Leonardo being found. Initially the evidence seems to have blockbuster potential, though on more careful reading it must be noted that is perhaps the desired effect. Seracini invoked no less a comparative example than the Mona Lisa as a source for a common pigment type - a seemingly signature mixture of black pigment also seen in the famous portrait. It should be clarified that there is some validity in searching for chemical analogues in Leonardo's panel pieces as his peculiar approach to fresco was to experiment in methods that allowed him greater time to apply the pigments, as in oil painting. The data...was obtained by an endoscopic sounding inserted in the intervening space behind the Vasari painting. 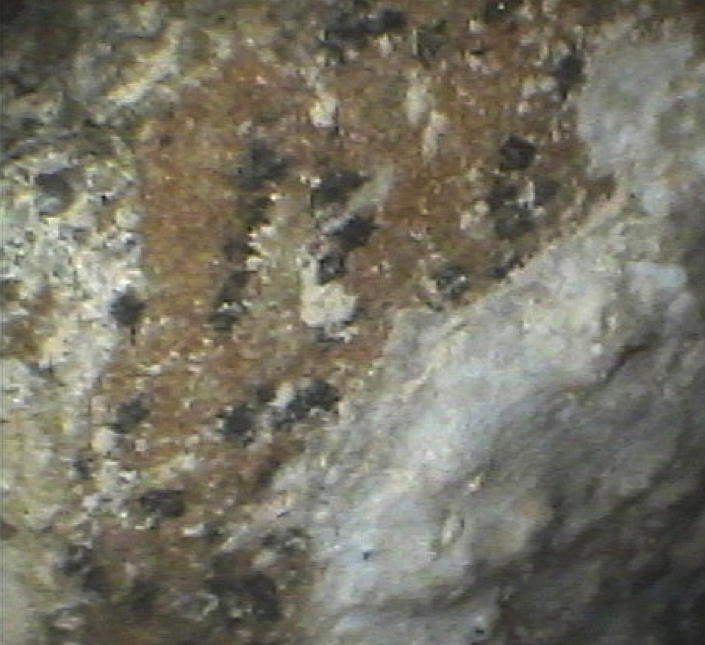 The sounding, carried out by telecamera, allowed the team of investigators led by Maurizio Seracini to see what was hidden behind the fresco and to collect samples of material that will be subjected to further analysis. “But the most peculiar thing is that in this black, the relationship between manganese and iron is inverted in respect to the normal combination. This anomalous relationship was recently found in a very recent publication by the Louvre, in a similar concentration , in the dark shadings in the paintings of the Mona Lisa and the Saint John the Baptist. This black—concludes Seracini—is rather anomalous or rather specific to Leonardo. Three other proofs in support the hypothesis that there are remains of “The Battle of Anghiari”, would seem to be furnished by traces of red lake, a beige layer painted by brush, and the existence of a space behind the wall painted by Vasari. 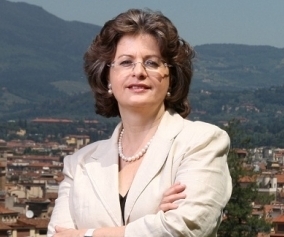 For this reason, the Mayor of Florence Matteo Renzi, has communicated that he wishes to reach an agreement with Minister of Culture, Lorenzo Ornaghi, to continue the research. We are dealing with a winding road. Now it is necessary to go deeply into these initial results of the investigation and months will be required to carry out the necessary analyses. When we reach the end, there might be a disappointment. As of today, our only certainty is that there is an intervening space and that there are the same substances that Leonardo used for the Gioconda and the Saint John the Baptist....it is now necessary to proceed step by step, using non-invasive methods. Somewhat conversely to this, the Mayor of Florence, Matteo Renzi has been exuberantly adding his support to further investigation with an eye to the eventual retrieval of the Leonardo fresco. In a challenging economic climate, the acquisition of a "new Leonardo" such as Salvator Mundi or La Bella Principessa would be a tall order. A somewhat less expensive option is to attract private sector investors to fund the investigation and possible salvage. National Geographic's involvement is well known - less so are other entities who would have a vested interest in salvaging the fresco, if it is determined that a substantial portion remains and salvaging it is feasible. 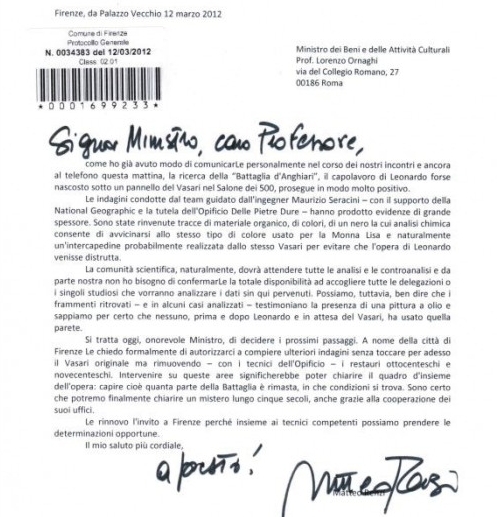 Renzi's letter to the Minister of Culture is relatively subdued compared to the enthusiasm shown in tweets and press conferences. Our object today, Honorable Minister, is to decide on the next steps. In the name of the City of Florence, I formally ask you to authorize us to carry out investigations without touching the original Vasari for now, but removing—with the technicians of the Opificio—the nineteenth and twentieth century restorations. Intervening in these areas means that we will be able to clarify the context of the work: revealing what part of the Battle remains and in what condition it is. I am sure that we will be able to resolve a mystery that is five centuries old, thanks as well to the cooperation of your administration. A chance to de-mythologise the Renaissance? A somewhat less predictable reaction has come from the UK press. Seemingly less concerned with drill holes and the ethics of private sponsorship, journalists have taken pause to reflect on the impact of the reality of Leonardo's fresco being revealed. This by Mark Hudson in The Telegraph (UK). Yet even if a substantial chunk of the Battle of Anghiari is unearthed I suspect the experience will be disappointing. Not only will it be in a deleterious condition, but rather like those lost and legendary albums you wait half a lifetime to hear, only to find your internal life somehow the poorer for the experience, the idea of Leonardo’s painting may prove to be far more potent and inspiring than the actuality. While Hudson's summary may ring true - there will be a palpable level of disappointment at seeing a ruined fresco - the prospect of finding and confirming it is Leonardo's lost fresco is exciting in terms of further research into Leonardo's working methods. Since Vasari, the battle cartoons made by Michelangelo and Leonardo have taken on a mythological greatness. Artists around Italy, even Raphael, are are alleged to have dropped everything and hastened to Florence. The reason that he did not continue at it was that some painters in Siena kept extolling with vast praise the cartoon that Leonardo da Vinci had made in the Sala del Papa of a very beautiful group of horsemen, to be painted afterwards in the Hall of the Palace of the Signoria, and likewise some nudes executed by Michelagnolo Buonarroti in competition with Leonardo, and much better; and Raffaello, on account of the love that he always bore to the excellent in art, was seized by such a desire to see them, that, putting aside that work [in Siena] and all thought of his own advantage and comfort, he went off to Florence. Among the greatest difficulties in using Vasari as a source is that he switches gears between being a primary or secondary source of information - even going as as far as including unverified anecdotes about artists which make such accounts little more than hearsay. Yet when Vasari recounts his own experiences and reactions to viewing works in situ, he is indeed a primary source for those instances. This is an important delineation that must be made, and is commonly overlooked when Vasari is quoted, particularly in reports aimed at a more general audience. The search for Leonardo's fresco attracts an increasing amount of attention, and according to Mayor Renzi, private investors willing to foot the bill to salvage what may lie underneath Vasari's fresco. The logistical nature of how this is going to be achieved is yet to be elaborated, though will most assuredly rely upon a successful collaborative approach fostered under the guidance of the Opificio delle Pietre Dure. A report in La Nazione describes the visit to Florence of Lorenzo Ornaghi, the Minister for the Arts and Cultural Activities. He did not go to view the scaffolding at the Palazzo Vecchio and did not meet with Maurizio Seracini. He is noted to have visited the Uffizi, where he met with Dr. Cristina Acidini. It was reported that he also met with Mayor Renzi and Terry Garcia (the Executive Vice President for Mission Programs for the National Geographic Society). It has been previously reported in the Italian Press that the samples collected by Seracini's team have still not been forwarded to the OPD for further testing. Hence, progress on the search for Anghiari seems to have stalled. 3PP is greatly indebted to Dr. Edward Goldberg for providing English translations of press materials in Italian. Thanks for a nice summary of this confusing story. Cheers Frank - this was the ultimnate aim of course! There is such a frenzy around Leonardo, the tendency in some parts of the press to overhype things is omni-present. It's best to focus on the evidence and learn from the research being done along the way. Many thanks for this summary which is very useful for Italians too. Viewed from Italy, however, this story seems a bit different because everything is not as it seems. Thank you for the contribution Sergio. The position of the critics of the investigation has been covered sufficiently - in fact in the English language press you will notice Mr Montanari's viewpoint is sometimes given where the Dr. Acidini's (or Ciatti's) comments are not (see examples BBC ; LA Times) It is important to note however that Dr. Marco Ciatti is now the head of the Opificio - since late February - and there seems to be some selective sampling of commentary by journalists in this instance - his comments are reported less than those of Dr. Acidini, who was also present at the press conference. I found a mention of him in UK press - at the Guardian, though these comments seem to be the same as the brief quote included in the Il Corriere Fiorentino article you have posted. Hence although Dr. Ciatti has been named as the head of the Opificio quite recently, he has only commented on this case in a limited fashion. Given Dr. Acidini's extensive experience, I was hoping for this summary to give voice to the very valid comments she has made about the nature of the techniques used, and clarifying the need for further investigation. Anything beyond this falls into the realm of politics, which is beyond the scope of this presentation. The proponents of "Save Vasari" do not have a monopoly on wanting to see Vasari's fresco kept intact - and despite Renzi's exuberant comments to get to Leonardo underneath, anyone who loves art would support that the endeavour only be started after all due care has been taken to preserve both Vasari and whatever may lie underneath. As clarified in the post - the point upon which all parties would agree is that further investigation is required - the evidence presented at the moment is interesting - but inconclusive. On this point I would like to also point readers towards a blog post by Professor Martin Kemp on the nature of the evidence presented so far: link I tend to agree with his description in the comments - this case absolutely is a technical and political minefield! I was fascinated by your comment, “Viewed from Italy, however, this story seems a bit different because everything is not as it seems.” I wonder if you could talk about this a bit more—anche in Italiano, se preferisce. I live in Florence and I have been following this story with a kind of “fatal attraction” for some time. There is the characteristic “presenzialismo mediatico” (untranslatable, I fear) of Mayor Renzi on one side and Dr. Montanari’s variety of the same on the other. Mayor Renzi, however, has been quite smart (or at least, he has good advisors helping him with his official communications). He might tweet “"Leonardo c'è, tiriamolo fuori!" (“Leonardo is here, let’s pull him out!”) but his letter to Minister Ornaghi was quite calm and judicious—although there was the trick phrase, “senza toccare per adesso il Vasari originale” (“without touching the original Vasari, FOR NOW”). A lot of people are making a lot of noise and striking dramatic poses. Meanwhile, a few are talking calmly and sensibly and asking for facts. Cristina Acidini, it seems to me, has a realistic—and very professional—view of the situation. She also knows the Italian context well, this place where “things are not what they seem”. And above all, this place where nothing is going to happen soon! Many thanks, your scientific diligence is always very commendable. I completely agree with the comments of Professor Kemp. 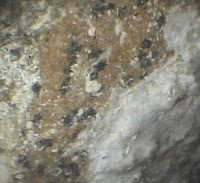 Moreover, his observations on the pigments found are obvious to anyone familiar with the fresco technique. Unfortunately, as you, and prof. Kemp noticed, there is the risk of ending up in the minefield of politic and entertainment. My comment was intended to emphasize this danger. I apologize if it was too laconic and if it could be misunderstood. I must frankly admit that I did not like the sarcastic tone of your answer. Especially because it usually does not indicate that serene judgment that yourself properly appreciate in your comment. Of course, who would not want to know more about the "Battle of Anghiari" by Leonardo, and who would not want to see this masterpiece at least partially? 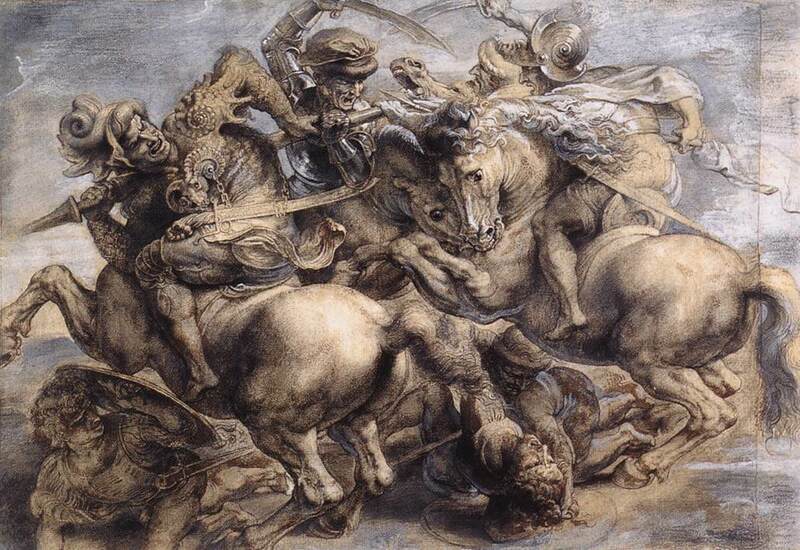 Or in comparison with the cartoons for the "Battle of Cascina" by Michelangelo? The answer is obvious. But I invite you to read, or read it back, calmly and sensibly, the following observations of professor Salvatore Settis. Perhaps his intelligence, infinitely superior to mine, will suggest you that on this topic one may have different opinions and respectable point of view. They shouldn't have drilled into a Vasari masterpiece. We know that technology is always getting smaller and less destructive. No harm in waiting a few more decades if it means we will save the art, especially if this art is extremely likely already destroyed or highly damaged. As a lover of Florentine masters, Vasari would not have hidden a work of a art in such a way, especially by Leonardo. That said, it is Vasari's own fault, because he teased us with the words 'Cerca Trova'. The gap is also quite indicative. He's fortunate that the craze happened now, because 100+ years ago the fresco probably would have been torn down! Sergio—I am sorry that my comments struck you as “sarcastic”, since I considered them merely “ironic” (e quà a Firenze, l’ironia è il contorno che va servito con ogni piatto!). I firmly believe that there is a lot of false drama and many false values in the present “media circus” regarding the Battle of Anghiari. That, indeed, is my principal point—and that, it seems to me, is Prof. Settis’ principal point as well. He is, of course, a person of rare seriousness—and unfortunately, I am not convinced that his seriousness is shared by everyone who has joined him in defense of the Vasari fresco (which is the paramount concern, I absolutely agree.) I would offer Dr. Montanari’s article as an example of false drama, since his references to political funds “in nero”, saint’s relics and apple cores do not contribute to the discussion. Meanwhile, I appreciate Soprintendente Acidini's efforts to "sdrammatizzare la situazione". My own feeling, Sergio, is that you and I are in agreement on the main point, namely that we would like to see what is under the Vasari fresco without harming it. That is also what Hasan is advocating in his post. In any case, let me assure you that no offense was intended! A presto, Ed G.
@Sergio - Thank you for the clarification. As we are in a public forum - not everyone would be as familiar with the constituents of fresco - which is why we are fortunate to have commentators such as yourself and Professor Kemp to clarify this for us. For those interested in a reference dedicated to technical examination of pigments, I would thoroughly recommed Dr. Nicholas Eastaugh and Valentine Walsh's "Pigment Compendium - A Dictionary of Historical Pigments" - a less technical but highly useful web based alternative can also be found at webexhibits Pigments through the ages. @Sergio & Ed - focusing on the items of common interest and objective truth is what we all wish was happening in this instance. Leonardo seems to bring out strong passions in all sorts of people - which is why assembling this summary was so challenging - and perhaps why I prefer to get back to my pleasant Raphaello when all this has settled! I'm looking forward to seeing the NatGeo documentary on the 18th - and noting how they present their evidence, and whether any external viewpoints are included outside of Seracini and his team. I find your contributes interesting but I must admit that I cannot see what this whole operation aims to do: mayor Renzi himself stated that finding Leonardo's painting should be a great "marketing opportunity" for Florence , besides being the conclusion of "one of the greatest mysteries in the history of art"... even though I cannot understand where the mystery is, because we know very well the history of this painting by Leonardo. So if the history of art is not some kind of "mysterious", history of art is not worth a mention? And we must reduce history of art to marketing? I think that this is not so much a matter of knowledge and even less a matter of science... I think that is a matter of common sense instead. Since you live in Italy you know that there is a huge quantity of cultural sites, museums, works of art, associations etc. looking for funds, and my personal (and mere) thinking is that this whole "campaign" is turning itself into a waste of resources. And we do not have to go far away because Dr. Montanari in an interview appeared in La Repubblica  and in an article written for Il Fatto Quotidiano  has been describing the poor conditions of some rooms in Palazzo Vecchio. You stated that Dr. Montanari's "presenzialismo mediatico" is a variety of mayor Renzi's same "presenzialismo". I think that he is only trying to struggle on equal terms: you ought to remember that Dr. Montanari does not write his articles for a scientific journal or whatever, he writes for one of Italy's most popular newspapers: Italian people are very interested to "dramatic" stories so I believe that if he did not write in this way nobody would have read his articles... :-) However I do not know Dr. Montanari personally nor I am interested in defending him... and I am not even an art historian so I cannot judge this whole story from a professional point of view but as I said before, in my humble opinion this is only a matter of common sense. Best regards and greetings from Italy! Unfortunately, I'm an heavy Venetian, and not as light as my Florentine friends. Moreover, my English is not full of shades as yours. As you say, there's too much confusion, show, and politics around this researches that we can't see the most important thing: the integrity of the only masterpiece of an old master now existing, Vasari's fresco. Federico—It seems to me that you are asking the essential question, “What is all of this noise really about?” Genuine issues of art and history seem to be largely besides the point. And even the “mysteries” (like the “dramas”) are primarily media inventions. There is a favorite saying of mine in English that could easily have been pronounced by a cynical Tuscan, “Why do they call it ‘common sense’? It is more rare than common!” Meanwhile, I think that Hasan is playing an important role in focusing on real questions that might even have real answers. Ed G.
Added translated segments from the article featuring Professor Settis published on March 13 2012 in La Repubblica. Web and PDF versions of the original article are also available in the references section. Again, a very heartfelt thanks to Dr. Goldberg for the English translations - rationally reporting Italian cultural heritage news is a somewhat complex endeavour - particularly *this* story. Thanks for the summary and clarifications! I have to admit, I feel like most of the coverage I've seen in the US has been by way of National Geographic. It's nice to get more insight into the other groups who are interested or affected by this project. Cheers M! It is a shame neither report really outlined the Louvre data vs the samples taken by Seracini's team. If they wanted to more clearly demonstrate their conclusions that the paint is peculiar to Leonardo, this data should be openly reported - with the Louvre comparisons, the Last Supper and other Frescoes of the era included in the samples for comparison. At present, many are quite adamant the evidence is inconclusive without actually having picked through the evidence! Mr Montanari thinks this combination of black is commonly found in Renaissance frescoes, Seracini (and the Louvre?) says not - if this was all reported openly we would not be having to rely on opinion and journalists to get to the facts. I hope the findings are more completely published at some stage - but as this is tied with with private organisations, am not holding my breath! We may hopefully get more detail once the Opificio has a chance to review the data?